For lunch, Dave, Papa, and I walked over to a place called Snack Depot. 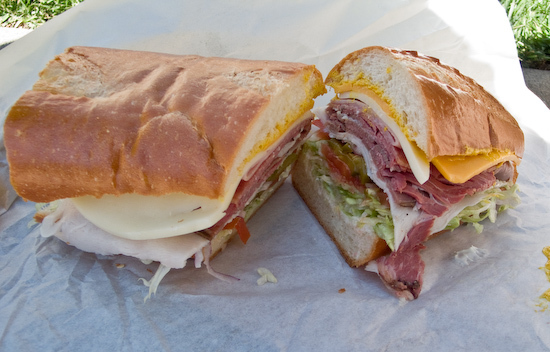 Snack Depot got incredibly high Yelp rankings (about 4.5 stars out of 5) with everyone raving about their sandwiches. We found it inside the South Tower of the office buildings at the southeast corner of Folsom and 2nd. I ordered a Super Combo sandwich with everything on it on a soft roll. The sandwich was very good - it reminded me a little of the sandwiches at Yellow Sub in South Lake Tahoe (Tina's and my favorite submarine sandwich shop so far). I really liked how there was a lot of fresh shredded lettuce, tomatoes, and pickles to balance the large combination of meats in this sandwich. 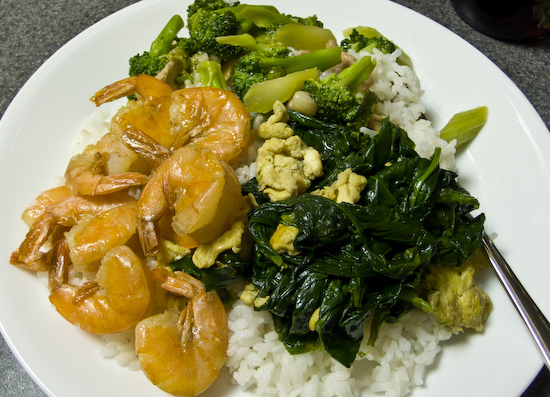 For dinner, Tina's mom brought us stir-fried broccoli with pork, spinach and egg, and shrimp over rice.